Returning to Wesleyan for a discussion on music and race, followed by a concert, Heems showed up late and seemed to go downhill from there. The stage at the CFA Hall was set on Saturday, April 18, for one of Wesleyan’s most recent high-profile alumni, the musician and former Das Racist rapper Himanshu Suri ’07 (“Heems”), to revisit his alma mater, about which he has voiced decidedly ambivalent opinions. However, as the 6:30 p.m. speaking time came and went, the question arose: Where was Heems? Finally, at approximately 7:45 p.m., Heems arrived at the CFA with former Das Racist hype man Ashok Kondabolu, better known as Dapwell, and apologized for the wait in a voice worn-down from the rigors of touring. While the conversation, a somewhat meandering and unstructured affair was concluded with relative ease, the uncertainty surrounding its beginning was an ominous sign of things to come for Heems’ performance later that night at Eclectic. The talk, billed as a discussion on race, music, and activism, was hosted by the Wesleyan Asian American Student Collective. 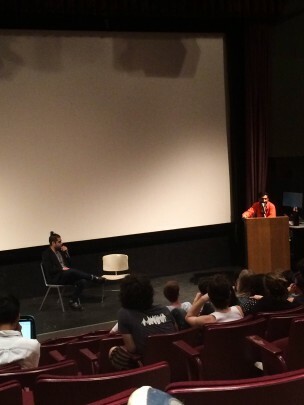 It consisted of an hour and a half Q&A session where members of the audience asked a diverse array of questions ranging from whether Heems had ever dealt with the Wesleyan judicial system (he responded with the Jay-Z lyric, “beat the charges like Rocky”) to what he thinks of appropriation in rap music, and how, as an Asian American rapper, he navigates its pitfalls. The nearly three years since Das Racist broke up have provided Heems with the hindsight to reflect on the Das Racist experience, and how its message was interpreted, or misinterpreted, by the media. The result of this cultural disconnect are articles like New York Magazine’s 2010 profile of Das Racist, titled “Straight Outta Wesleyan.” As the discussion on the misrepresentation of race and privilege in hip-hop culture evolved, Heems discussed his feelings on the way Das Racist, by virtue of the group’s association with Wesleyan, had been portrayed as elitist college grads who had no place in the medium. Since Das Racist broke up, Heems has undergone a complete character shift, or maybe he’s just becoming the artist he always wanted to be. Eat, Pray, Thug—his most recent solo release—is a serious record, one that seeks to frankly evaluate institutionalized racism and prejudice in the aftermath of 9/11, and it draws few parallels to Das Racist’s sarcastic and sometimes concealed messaging. It received relative critical acclaim, and, with lines like “product of partition/Dripped in Prada for the stitchin’/Proud of superstitions,” from the eviscerating album highlight “Patriot Act,” it’s easy to see why. However, a divide exists between those who characterize Heems as uncertain of his voice, like Pitchfork writer Jayson Greene (who said, “the most uncomfortable moments on Eat, Pray, Thug are like this, watching a guy try for ironic laughs and failing, and they feel like unwelcome holdovers from Heems’ previous life”), and those who proclaim him a hip-hop savior of sorts, like a Mic article from last month titled “Everyone Is Focused on Kendrick, But This Is the Most Exciting New Name in Hip-Hop.” Ismael Coleman ’15 challenged Heems on this Kendrick comparison, asking whether he felt the article was disrespectful of Kendrick’s contributions to hip-hop as well as generally ignorant in the comparison and its characterization of the state of hip-hop. Heems, appreciative of but seemingly uncomfortable with the Kendrick Lamar comparison, partially dodged the question by positing that, because his album only cost $10,000 to make, the production value and rollout were dramatically different. For this reason, he said, comparison would be difficult. However, he did open up about existing as a rapper outside of the black-white dichotomy, and about still feeling guilty about appropriation in hip-hop music. Instead, another Wesleyan rapper, the fiery Rhys Langston (Rhys Podell ’16), completely stole the show. As Heems’ opener, Langston faced a sizeable crowd, but one that was focused on the night’s headliner. Langston soon realized he needed to fire up the audience, and his dynamic live performance included crowd surfing, strolling through the crowd while rapping, and bringing up the entire front row (including this writer) on stage to mosh. Unfortunately, Heems failed to bring to the stage any semblance of the passion or energy that Langston exhibited. He emerged belligerently inebriated, and his performance was notable for its unhinged nature. Stumbling around the stage, the rapper would often mumble through lyrics or stop rapping altogether and scream into the microphone. At one point, he rambled on about how Eclectic was the best thing to happen to Wesleyan, a statement that was met with crickets. Even more troubling than his ineptitude as a performer was Heems’ decision to self-DJ off his iPod. While the tactic was unprofessional but not inherently problematic, Heems’ greatest error was his decision not to play instrumental versions of his tracks but rather the full studio version with his verses included. The performance devolved into Heems rapping over his own songs and often pausing to give the technician, Eric Poretsky ’18, advice, while his own lyrics would still be playing over the speakers. Soon, the listless crowd thinned out, and Heems concluded his performance in front of a half-full Eclectic audience. Heems, curiously self-aware, actually tweeted about his performance style yesterday, seeming to blame the crowd for its failure. Comments like these are indicative of Heem’s persona as a performer. Rather than admitting that playing the full versions of his songs while performing cheapened his act, he blamed fans for their inability to adapt to his amateurish performance style. Heems now presents himself as an artist with unflinching seriousness who clearly cares about holding art to a high standard. Because of this, a disconnect has emerged between Heems the musician and Heems the performer. Given how far his music has evolved, it was strange to see him stuck awkwardly between his Das Racist persona and a genuine cultural critic deserving of greater artistic merit.